Home » gifted » parenting » Why Did We Fail Susie? I am a fairly even-tempered person. It's hard to get me really riled up about something. But I cannot get this little video out of my mind - a video about two kids, Susie and James. This video was mentioned by someone in the online gifted community I participate in. It's a little slow going, so I will summarize it for you. It tells a story of a "regular boy" James and a "smart girl" Susie. James is given plenty of an opportunities to fail and learn and grow while Susie is praised for years for completing tasks that do not require any effort on her part. Finally in middle school, Susie starts having problems with math, she starts doubting her intelligence, and her self-esteem collapses. So... I dare ask, why did we fail Susie so badly? Why Didn't Susie Develop Growth Mindset? Growth mindset is a new darling of educational world, just as self-esteem was a few years back. According to growth mindset gurus, kids need to believe that their intelligence and abilities are not fixed, that they can grow through experiencing failures and recovering from them. We are told that it's not OK to tell kids they are smart, because this leads them to develop "fixed mindset". But you know what? I don't think that Susie failed to believe in her abilities because she was praised for being smart. I think that she was never challenged enough. You see, Susie was put in a mixed ability classroom where teacher was focused on getting James to master material appropriate for his age and grades. Susie was a good girl and was not a problem. She sat quietly and did her tasks diligently. She stopped asking questions because this behavior did not please her teacher. She was happy to help James when he struggled with math and language. She was praised for being a good team player. Susie's Mom did not go to school when Susie complained at home about being bored. She did not want to look like a helicopter parent. Instead, she told Susie that school cannot always be fun, and perhaps she can read a book when she finishes her assignments faster than anyone else. Susie spent a lot of her math and science time reading fantasy stories. Susie did not mind doing her homework in five minutes. In fact, she came to expect homework to be busy work not worthy of her attention. She got used to the fact that anything she does is "good enough" for her teacher whose attention was focused on James. She has never learned what it means not being able to solve a problem on the first try. Well, obviously there will be consequences for Susie. It is hard to break bad study habits and develop new attitudes while also going through hormonal swings of adolescence. But her elementary school teachers will not have any consequences. After all, Susie met and exceeded test benchmarks in elementary school, so she was their success story just like James. They did not have to account for her progress the way they had to show James' progress. As long as she stayed in "met standards" category, she was "just fine". Really, one cannot blame her teachers in realities of standards-based classroom for not giving Susie additional attention, since nothing in their measurable objectives would tell them to do so. I don't want to criticize all teachers. Our third grade teacher passionately believed that her goal is to "give a year of learning to every student regardless of his/her level". It was a year when we did not have to have "those conversations" even once. The teachers like Mrs. L would not let Susie fly under radar, but the overwhelming majority of teachers might give Susie good books to read but will not have necessary material and time to challenge her in science or math. How Can We Help Susie? When my own "Susie" started school, I thought that the right approach is to challenge her at home. And we did that for years. Smarty went deeper into math, and she went further as well through Khan Academy. We also did many different STEM activities that you can see on my blog. But... Smarty is lucky to have two parents with rather flexible work schedules and disposable income. I also came to realize with that it's not fair to expect her to do extra work at home while she already spends 6+ hours of school. Those hours need to be hours of learning, not hours of boredom or hours spent trying to fit in and please teachers and peers. This is why I have to say - we cannot rely on parents to support and nurture gifted learners while schools teach to the middle. We need teachers to care about Susie just as much as they do about James. And that means we need to advocate for Susie. Susie parents have to be in school demanding an appropriate education for their daughter. Also, we, parents, should not see the struggle of our child as a bad sign and rush to the rescue. We should learn to embrace and support productive failure. If enough parents do that, especially if they work with each other, teachers and administration will have to take notice. Only when Susie works on her level from early days in school and learns to struggle and fail, the schools can say that they did right by her. Are you Susie's parent or perhaps her teacher? What are you doing to help her be challenged in school? Share your favorite insights in the comments or on my Facebook page. I completely agree with you on the assessment why Susie fails. Unfortunately, the culture of doing school needs to change. I had a top class with gifted learners who all got 100s. When I tried to challenge them, the parents were upset they were no longer getting perfect scores. You just can't win. And then there are parents who are concerned that their child is falling behind because the curriculum is too hard or too fast moving. Can you see that we need a paradigm shift towards personalized education? So much wasted energy when we can be doing something! One issue is that the US public school education system was originally created to train factory workers. It hasn't changed ENOUGH now that we no longer need many factory workers (robots have already taken over most of those jobs, and will probably eventually take over all of them). My husband had a great public school experience, but he somehow wound up in a school district that was willing to bus a 4th grader over to the middle school for math class, and then a middle schooler over to the high school. Our school district is not willing to do that type of accommodation. I suspect this issue is behind my 5th grader's current campaign (started halfway through 4th grade) to homeschool for 6th grade. Can I just forward this to my daughter's teacher. I already talked to one teacher about her skills and she just got switched to a different class because the school wound up with more kindergarteners than expected. I thought the first teacher was giving assignments that were too easy, but today she brought home work that are on par with her baby sister's abilities. So frustrating. Ditto Maryanne's comment. The old model served a different purpose in the past. Schools will be forced to change as more and more kids come out unprepared for the future. I do see some changes but not enough. If you get a chance, I recommend reading A Whole New Mind by Daniel Pink. Completely agree. It's a sad reality that this occurs in so many classrooms. 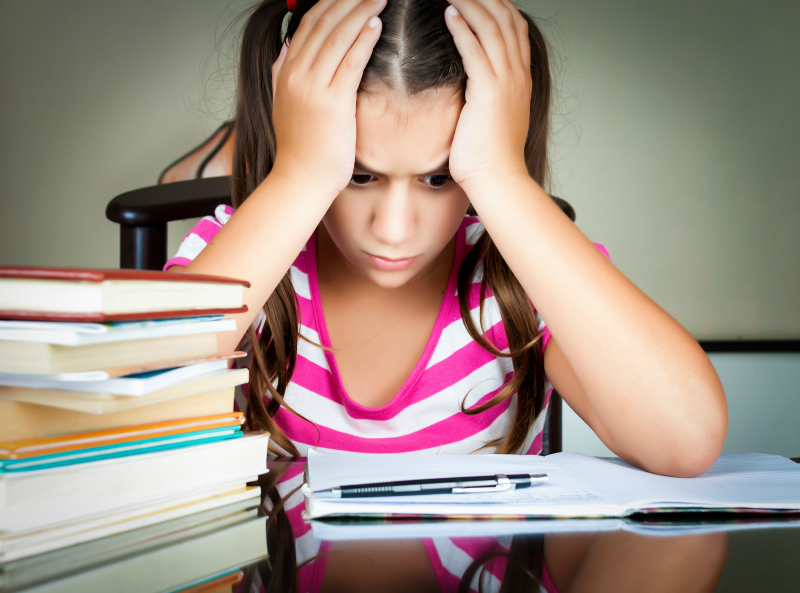 There is no room for gifted children - teachers are overwhelmed and pressured to address the needs of struggling students, and gifted children who easily achieve good grades are ignored. Thanks for highlighting this problem. Our 1st grader is again bored for large chunks of the school day, just like she was in kindergarten. We don't know what to do - she spends 6.5 hours a day in school and it's not fair to expect her to spend hours more doing academic work that she actually finds challenging. Other parents feel it's "elitist" or selfish to want her to have appropriate challenges; they say that we think our kid is a special snowflake who deserves "special" treatment. They say that we're setting her up for failure later by not teaching her that sometimes she's going to be bored or has to do tasks that she doesn't enjoy. We're told that you can't distinguish a bright child from a gifted child at this age, and that our kid just has the advantage of having gone to an excellent preschool daycare. I always hear, "She'll level out with everyone else in a year or two", said in a somewhat self-righteous tone. The same people who think it's elitist to admit your child is ahead of grade level and needs a more appropriate challenge in school because "she'll end up just find regardless" will fight to the end of the earth for a student on the other end of the educational spectrum to have an appropriate education. With two college-educated, professional parents and disposable income for enrichment on our own time, our child is already an outlier in her Title 1 elementary school where most students come from working class/blue collar or poor families. When her very nice teacher is spending the majority of the day working with ELL students, students with significant special needs, or who just aren't at grade level, she doesn't have the time to work with the handful of kids who are already meeting or exceeding those standards. It's not her fault, it's the fault of this educational system that's geared towards age-based classrooms and in all too many cases is focused on improving standardized test scores rather than improving education for ALL students. This has been irritating me for years. My daughter's first-grade teacher told me that girls often do well with math until middle school. The reason? Girls are developmentally ready for higher order math skills than boys. However, the curriculum is geared for boys so the girls miss out on critical skills at the appropriate time. Our schools don't really properly serve anyone in many ways. Our kids are capable of so much more than we expect.